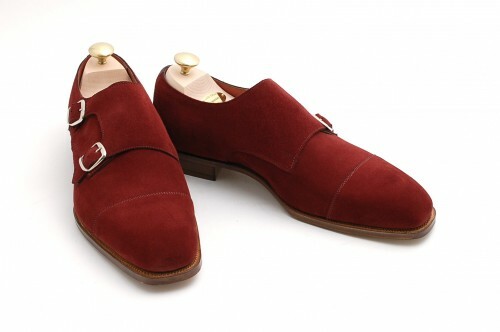 It’s not very often that you see red suede shoes, particularly coming from a company rooted in England. It’s even far less common that you would see someone wearing these down the street. Yet that would be very cool. Apparently these were an MTO order, for a customer at Leffot (of which the pictures are courtesy of). When you think about it this way, there existence under the name Edward Green makes more sense, as I don’t believe that they would ever produce something for their ready-to-wear lines. But then this brings up the age old question: with all of the beautiful shoes being sold each day in the world, why is it that I never see anyone wearing them? Do people only keep their cool shoes for special events? For parties? What? I just don’t get it. It’s not like I wear my red shoes with white piping everyday, but they definitely get a some wears throughout the year. 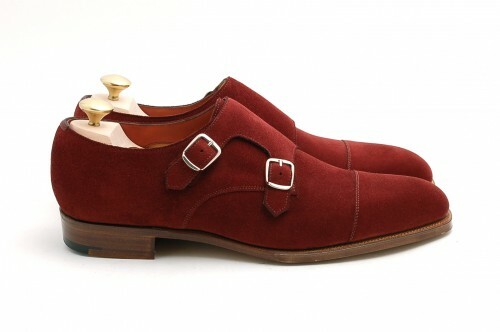 But rarely do I see something exciting, such as these, gracing the feet of some well-dressed gentleman. It’s never too late…..wear your exciting shoes proudly! Wonderful, although suede is quite a PITA (excuse the French) to maintain. I think everyone, at least during work hours, still obey the old unwritten code “Shoe can be black or brown, and THAT’S IT”. By the way, about a year ago I saw quite a lot of blue shoes in the streets (I’m italian). Zino – And where did you see that, in Italy? That’s the beauty of Italians, they are not afraid of a little color, or even a lot of it! I definitely appreciated all of the wonderfully well-dressed gentlemen that I saw while living in Firenze.